To Book your LADIES Hat for Royal Ascot Races, please use the link below. There is NO mail order service for Royal Ascot week. All Hats are for Collection and return from the Royal Ascot Tennis Club. 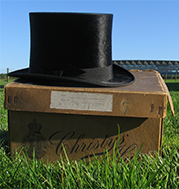 For dates outside 18th-22nd June 2019, you can book your hats on our Mail Order service, for other Races, Mother of the Bride, Queens Garden Party, or other events, please book using the link below. Mens Hat Bookings are taken by Phone only. Tel: 07958 950303. International feel free to email us on: bookings@dress-2-impress.com if calling is not possible.